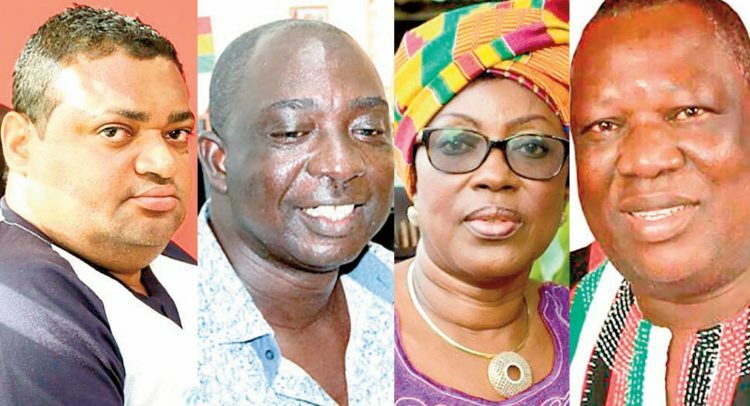 About six aspirants believed to be aligned to former President John Mahama were defeated in the regional elections of the National Democratic Congress (NDC) held over the weekend, making the comeback of the former president a bit shaky. DAILY GUIDE learnt that some six candidates who enjoyed the support of the former president were rejected by delegates in their various regions. In the Eastern Region, Bismarck Tawiah Boateng was defeated by John Owusu Amankrah, popularly known as Jowak, while in the Northern Region, Alhaji Ibrahim Mobilla Abdulai, a farmer who is believed to be the godfather of Haruna Iddrisu, Tamale South MP, beat former Northern Regional Minister Bukari Moses Mabengba, who also served as Ambassador to Angola during the previous Mahama administration. Ghana’s former Ambassador to Cuba John Akologo Tia was floored by Alhaji Bolnaba, who polled 282 votes, with the former Ambassador and longest-serving MP for Talensi polling 49 votes for the Upper East chairmanship position. Mahama’s darling boy in the Ashanti Region, Joseph Yammin (611), could not survive the onslaught by Andrew Nana Akwasi, a businessman, who had 669 votes. Yammin served as the party’s Regional Secretary until his appointment as Deputy Minister for Youth and Sports by John Mahama. In Accra, Joseph Kobina Ade Coker, the incumbent Greater Accra Regional Chairman, who was on Mahama’s ticket, retained his position while Aquinas Tawiah Quansah, a former Central Regional Minister and Mahama’s candidate in the Central Region also lost in the race. The most shocking defeat was in the Volta Region, where the hopes of former Transport Minister, Dzifa Aku Attivor, to lead the NDC to capture power from the governing New Patriotic Party (NPP) were dashed by incumbent, John Kwadwo Gyapong. Ms. Attivor, who was heavily tipped to become the first female chairperson of the party in the region, polled 374 votes as against the 491 votes garnered by veteran politician, Mr. Gyapong. To make matters worse, Ms. Attivor’s right hand man, Egypt Kudotor, also lost his position as Regional Youth Organizer to Matthias Alagbo, his deputy on Friday ahead of the main battle. Although many delegates, prior to the elections, had hinted they were going to change the current leadership of the party in the region due to their poor performance in the 2016 elections, it appeared they did not find a suitable replacement in Ms. Attivor, who resigned her position due to the infamous Smarttys bus branding saga during the previous Mahama administration. Not even her ‘closeness’ to former President Mahama and rumours that she was to play a key role in his comeback in 2020 could convince the delegates to give her the chairmanship position. Egypt Kudotor, the protégé and personal assistant of Dzifa, also had 47 votes as compared to 51 by Mathias Alagbo. Results of the Volta Regional Delegates’ elections, which entered late into the night, formed the second part of NDC Regional Delegates’ Conference held on Saturday, September 1, 2018, at the Dr. Afeti Auditorium, Ho Technical University. The incumbent Secretary, Simon Amegashie-Viglo, who is a known ally of Mr. Gyapong, lost to James Gunu, former District Chief Executive (DCE) for Akatsi North. Mr Gunu also defeated former NDC MP for North Dayi, George Loh, and Manfred Nuku-Dei, a long-standing administrator of the party. Henry K. Ametefee and Maxwell Owusu-Siaw were elected as the two Vice Chairmen for the region while Ben Siki Abibu became the Regional Organizer. Kafui Agbleze was elected Communications Officer, while Treasurer position went to Dan K. Agboka Dzegede. Fafa Agbai, a former DCE for North Tongu, was elected as the Regional Women’s Organiser while Hajia Hawa Tahiru became the newly elected Zongo Caucus Coordinator. Other winners are Chester Sena Ati (Deputy Organizer), Adzroe Marian and Magyam Paulina (Deputy Women Organisers), Evelyn Gaglozu (Deputy Treasurer), Ege Bright Kwame (Deputy Secretary), Sulemana Mumuni and Kwame Ricky Asiemoah (Deputy Youth Organisers) and Bright D. Kugbeadzor as Deputy Communications Officer. Present at the conference were Koku Anyidoho, a Deputy General Secretary; Kofi Adams, National Organizer; Kofi Attoh, senior member of the party; Sylvester Mensah, presidential hopeful; and other NDC MPs in the region, among others. At Kumawu, Andrew Nana Akwasi, a businessman, was elected as chairman with 669 votes to edge out Mr. Yamin (611 votes), while other contenders T.K. Braimah and Kayad Adu Gyamfi polled 18 and 8 votes respectively. A senior lecturer at the Kumasi Technical University, Kwame Zu became the Regional Secretary with 757 votes beating Evans Amankwa, who had 583 votes. Mr. Zu was Raymond Tandoh’s Deputy at the NDC’s Ashanti Regional Secretariat. Isham Alhassan also secured a landslide victory with 892 votes to become the new Regional Organizer after he beat competition from three other candidates while Alhaji Salisu Musah secured the Regional Vice chairmanship position with 448 votes after defeating six other contenders for the race. Hopeson Keku was elected as the new Regional Treasurer while the Regional Communications Officer position went to Abass Nurudeen, who would be assisted by Alex Asafo Agyei, who obtained the highest votes in the elections with 1,129. Other people who got elected are Prince Atta, Deputy Treasurer; Matthew Njourkone, Deputy Treasurer; and Alhaji Bashiru Amissah, Deputy Organizer. The Regional Youth Organizer and his Deputies, as well as the Regional Women’s Organizer and her Deputies, were elected a week ago in line with the NDC’s constitution. The Regional Zongo Coordinator, Sumaila Aliu Futah, was elected unopposed. Party gurus like Betty Mould-Iddrisu, National Vice Chairman; John Alexander Ackon, a former Ashanti Regional Minister; Samuel Sarpong, a former Ashanti Regional Minister; Vida Addai, National Deputy Treasurer; Kojo Bonsu, former KMA boss; and Captain Butah, were there to lend their support. In the Central Region, E.K. T. Addo was elected as chairman to replace Bernard Allotey Jacobs who did not seek re-election after the party’s abysmal performance during the 2016 general elections. Aidoo Mensah became the Vice Chairman but in the race for the Regional Secretary position, it was a tie between Kojo Quansah and Nii Kommey Adams. The Deputy Secretary position went to Kofi Matthew while Eric Essuah became Treasurer with Nana Osebi Quansah as Deputy Treasurer. Regional organizer position went Derry while Kwesi Dawud retained his post as Communications Officer. The Women’s Organizer position was won by Faustina with Youth Organizer position going to Dadson.